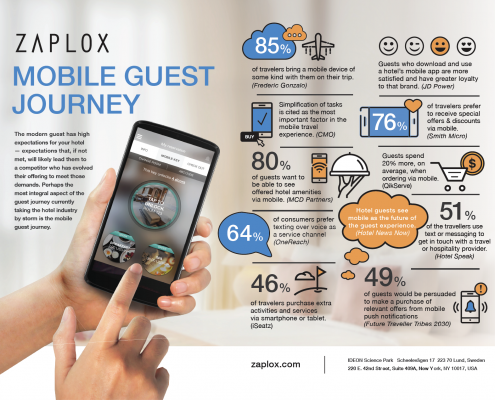 You are here: Home / News / Zaplox Unlocked / Could Mobile Guest Journey be the Key to Your Hotel’s Success? In the past few years, we’ve witnessed a great deal of change within the hospitality industry. 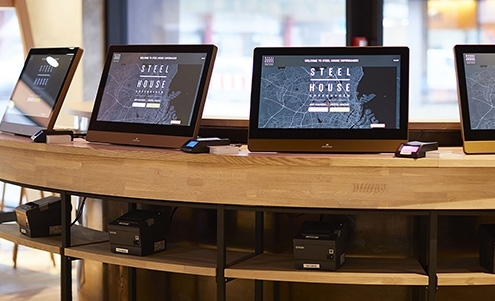 From the technology hotels use to streamline operations and stay current, to the way hoteliers can capitalize on touch-points and offer a more personalized experience, hospitality is headed in an undeniably exciting direction. Of course, we can’t speak to the technological evolution(s) rapidly expanding across hotel properties, without addressing the mobile guest journey and the integral role which it plays in revenue, engagement, guest experience and positive reviews. 62% of travelers say they would like to use their smartphones to order room service or amenities. 60% of travelers around the world said they would be unwilling to travel without a mobile device. 46% of millennials say that being able to check in and out using their mobile devices would motivate them to return. 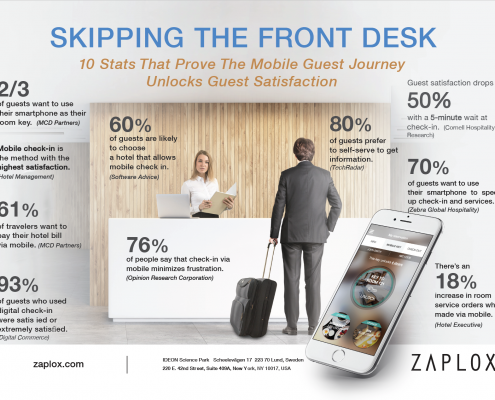 68% of guests want to speed up the check-in process by using their smartphones. The mobile guest journey is no longer perceived as a supplemental or optional experience — it is the experience. 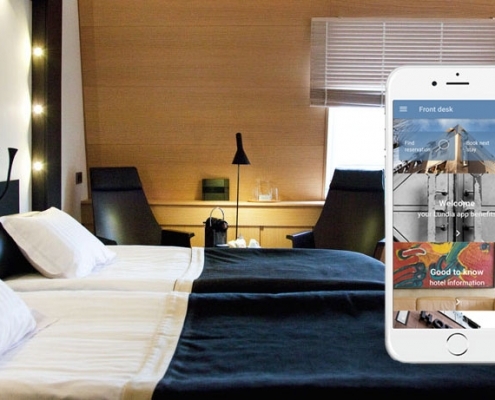 Hoteliers now occupy a position in which the question of investing in mobile technology is no longer a question at all, it’s simply a guest demand. Luckily, the continued expansion from physical guest service to digital guest service represents an important opportunity for improved guest loyalty, enhanced operational processes and increased revenue. 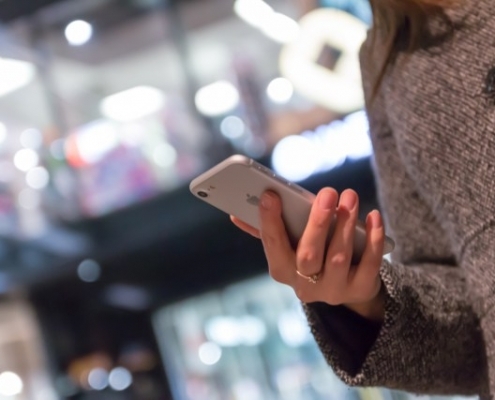 The digital journey never overtakes the traditional service model; rather, it aligns with it to create a more personalized, seamless experience with more opportunities to connect with guests and create a truly memorable stay. And — if you ask us — mobile, keyless entry might even be the key to your hotel’s success. It’s clear that modern guest satisfaction is heavily influenced by our digital world. With more hoteliers on board to meet the demand for a smooth and personalized service, the better the guest journey, and therefore, the better rated your hotel becomes. There’s nothing simpler and more accessible than what we hold in the palm of our hand. 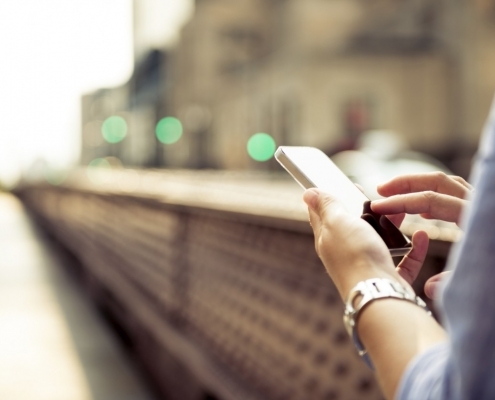 Your guest’s journey should start and end with their smartphone. It’s time for hotels to invest in the right technology to stay ahead of the curve and keep your guest coming back. Undoubtedly driven by millennials and modern, tech-loving guests, the industry-wide interest in the implementation of mobile keys has reached an all-time high. In fact, 93% of guests who used digital check-in were satisfied or extremely satisfied and, on average, guests using a digital key rate a hotel seven points higher than keycard guests. That being said, entry to a hotel room may seem, on paper, like a minor touch-point — so why does it hold so much value? The answer is ultimately rooted in the increasing demand for a frictionless experience with self-service capabilities, across all major (and minor) touch-points of a consumer’s interaction with a brand. In the case of hotels, the check-in process has traditionally been rife with frustrations. From extensive front desk lines and delayed check-in, to de-magnetized or lost room keys and impersonalized offers and communications, guests were frequently left craving a more convenient, efficient process. In fact, Booking.com found that 80% of customers prefer to self-serve in order to get the information that they need and mobile check-in is the check-in method associated with the highest satisfaction. The utilization of mobile key technology helps to remedy these long-standing issues, by offering in-app check-in (with a simple tap of the finger), secure room access via a smartphone device and customized, in-app offers to guests. This implores a more efficient experience without sacrificing security, and allows hotel staff to spend less time stuck behind the front desk. The less time hotel staff spends attending to cumbersome, administrative tasks, the greater opportunity they have to create a personalized, memorable experience for each guest. The shift away from plastic keycards also plays into the increasing demand for sustainable travel and eco-friendly hospitality technology. Millennials and Gen Z travelers especially will look for more sustainable travel options, such as reducing their plastic usage. In fact, a third of travelers look for a company/hotel that is sustainable when researching their next trip. With the implementation of mobile key technology, hotels can eliminate the wasteful practice of traditional, plastic keycards and appeal to the eco-conscious generation of travelers. With improved technology and an optimized mobile journey, guests are finally able to focus solely on the travel experience they are seeking, unburdened by inconveniences.